Here are some frequently asked questions and answers for readers who are just beginning to charge money, or adding cards to their services. 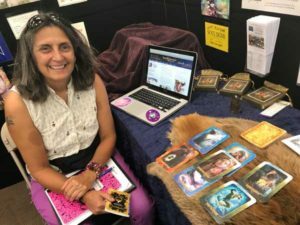 How many readings should I do before I charge money? 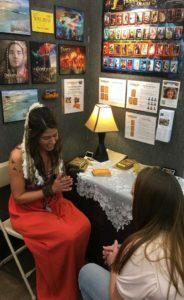 How much should I charge for a reading? How will I know which spread to use? What if the seeker has a lot of questions or issues? I don’t feel a connection with the seeker. The seeker started crying. Did I do something wrong? Help! The seeker got angry and demanded a refund. The seeker doesn’t want to say their question out loud. How can I read their cards? I’ve done several readings back-to-back. Now I’m overwhelmed! What should I do? How often should I take breaks between readings? A returning seeker keeps coming back with the same issue! I’m getting sick of telling them the same thing over and over. Any advice? I’m new to cards. How many readings should I do before I charge money? A general guideline is to do at least 30 readings before charging money. This number can vary, but the important point is to be familiar enough with the cards that you can read the spread without looking up every single card in the guide book. Seekers pay for your interpretations and expertise. It is suggested to know at least 5-6 different spreads by memory. Reader rates vary from $1 per minute to $6 or more per minute. Some shows require readers to charge a certain fixed rate, such as $20 for 20 minutes. Other shows are flexible. If you’re just beginning your business as a reader, it’s helpful to start with a low to moderate rate that builds your client base and generates returning clients. Offering an incentive for referrals or return business, such as a 10% off coupon, can help bring more regular readings. In deciding what to charge, remember to factor in overhead and costs. For example, if you are reading at a show, how much is the booth fee? How many readings would it take to make the fee at your current rate? How many hours or days is the show? How many shows have you done? Costs like transportation, parking, hotel, meals, and so on can add up. Have you factored them into your rate structure? If you are renting space by the hour or one day a week, how many readings to do you need to do to earn a profit? If you read using a video chat app, consider your WiFi or data costs, the upkeep of your mobile phone or laptop, video recording software, and so on. When reading for a new client, it helps to chat a little first, to put out your antennae and get a little grounding. A quick 3- or 4-card spread, such as Levels of Being, Yes / No / Maybe, or Element Balancing can be a good starting point. These spreads give a quick glimpse into what’s going on and often draw out the seeker. Short, quick spreads can always be expanded for more clarity. Sometimes a longer, more detailed spread is the way to go, depending on time and your intuition. Asking the seeker which number they prefer – 7 or 10? – can help determine whether a Chakra spread (7 cards) or Celtic Cross (10 cards) will work best. When someone’s life is in transition, it’s normal for every aspect to be chaotic. Relationship, money, home, career, and health may all be up at once. First, try to reflect the seeker’s situation by saying, “Wow, that sounds like a lot all at once!” Make it clear you will do your best to help. Before starting, clarify whether the seeker is open to a longer reading to explore each issue one at a time. If so, start with the most pressing issue, then one by one address each of the seekers concerns. A series of short spreads may be best. If the seeker has limited time or funds, try something like this: “Let’s let Spirit show us what’s going on!” Then, follow your intuition about where the key concerns are. Remember the Project spread, Relationship spread, and the Expanded Past-Present-Future. Sometimes, simply pulling a series of cards and spreading them out intuitively works with many issues at once. With this approach, the position of the cards is not as important as simply seeing all the cards together and interpreting their energies. Seekers often connect immediately with specific cards. And the Transformation Oracle tends to be highly accurate when we align with Spirit, bringing our seeker into alignment with a short prayer or affirmation before the reading starts. Most readers energetically draw to themselves seekers whose issues are similar to their own. This is the ideal fit and often creates long-term, returning clients. At fairs, shows, and parties, however, some seekers may not be the best fit for us. If this happens to you, take a moment to check in with Spirit, perhaps doing a quick Yes / No / Maybe spread for yourself to see if it’s in your highest good to help this person. While it’s always a good idea to help as many people as possible, it’s important to be discerning, too. If you do turn away a potential client, consider how this could be done with kindness, concern, and positivity. Occasionally a “difficult person” can be a great “teacher” on many levels. Only you will know whether this person brings you an opportunity for spiritual growth, or is truly a mis-fit for your abilities. What are our own—possibly hidden—motives for doing this reading? Are we saying, “Yes” to someone if intuition or the cards indicate it might be best to say, “No”? If so, why? Are we second-guessing our intuition? Acting out of financial fear? And so on. Getting honest with ourselves is a key to giving great readings for others. Sometimes it’s clearly not in our best interests to read cards for a certain person. 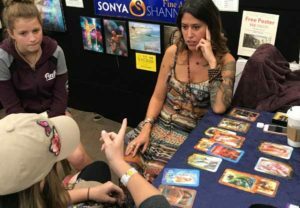 For example, a first-time visitor to a metaphysical fair may be very skeptical, falsely believing that psychics should “know everything” and just waiting for you to be “off” or “wrong” about them. Their attitude of mistrust and contempt blocks the kind and loving guidance that flows from Spirit. In that case, consider saying something like, “I’m getting the message that I’m not the best person to read for you. I’m going to suggest you find another reader…” Or, “You know, I’ve found that Divination only works when people are open to receive the gifts from Spirit. 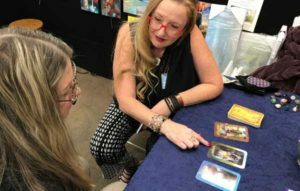 I can’t read if a person isn’t open to it.” Or, “If you’re afraid to know what the cards say, why do you want a reading?” Pointing out the truth sometimes has the effect of awakening or reassuring the person, and they end up having a reading after all – especially if their open-minded friend has a helpful reading first! Not at all! Seekers come for readings because very deep, often hidden feelings underly their situation. 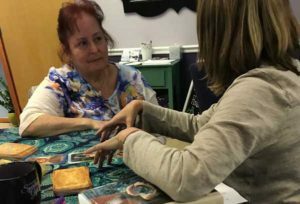 In many cases, readers and light-workers are a kind of “therapist” in helping seekers understand and work through some of their issues. Readings can cut to the core of a person’s circumstances and shed light on painful truths. In that sense, a good reading is an awakener. Sometimes people cry because their lives are filled with abusive, cruel, or heartless people. Being kind and loving brings their tears of gratitude, grief, and self-awareness to the surface. Consider bringing tissues to your readings. Crying happens. It’s all part of the process. Help! All I did was read the cards as I saw them. The seeker got angry and demanded a refund. It’s not my fault if they didn’t want to hear THE TRUTH! There are certain people who react with anger to card readings. Hopefully, over time we learn to discern this type of person beforehand, and either prepare to handle their anger/discomfort or redirect them elsewhere (see above). At some point, nearly every reader has an unpleasant experience with a seeker who gets angry. We question ourselves: is it our fault? Or theirs? If we feel like we have another person’s life or problems all figured out, chances are our EGO has taken over and we’ve lost our connection to Spirit. Despite being seers and having empathic or intuitive knowledge, we don’t know everything about another person. More importantly, as readers we are not in charge of another soul’s growth! Our approach may have triggered their anger. 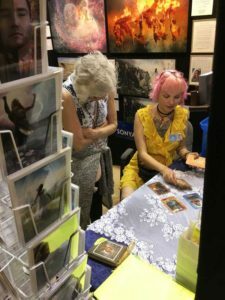 As readers it is our job to interpret cards and help the seeker resolve their situation—or at least shine light upon it. Language plays a big part in how our reading is received. 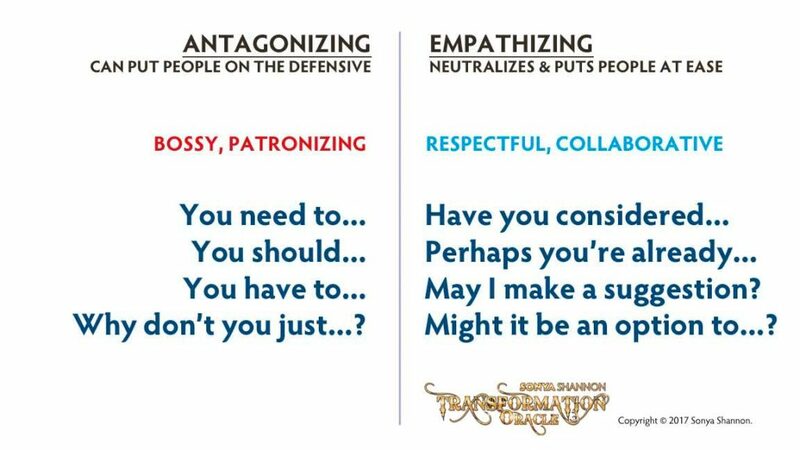 The chart below contrasts an antagonizing approach with a more collaborative, empathizing one. 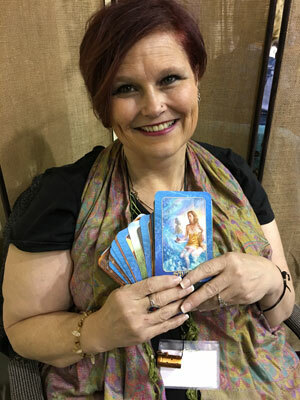 While it’s common to give advice by stating, “You need to…”, people often feel “attacked” or that their boundaries have been violated when we “tell them what to do.” A more respectful, supportive approach is to affirm the seeker, offer suggestions, and use more collaborative or empathizing language in the reading. Same cards, different delivery. This skill can be learned through conscious practice, listening to our own words, and stopping to correct our approach as needed. It’s also important to have a policy about refunds. If you are sure you would never refund a person their money, make sure you state this clearly upfront in a sign or in a verbal explanation. If you are open to refunds, a case-by-case approach may work well. Everyone makes mistakes. In order to stay close to the light, we can continually re-examine our part in a flare-up, and if we spoke antagonistically or out-of-turn, make the apology and/or the refund. 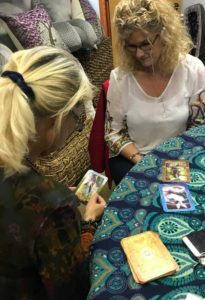 When intuition is clouded or a seeker doesn’t want to open up, we can explain that even though we are readers / psychics / light workers, sometimes we get more clarity with a little information or response from clients. On the other hand, respecting a client’s decision not to state the question out loud builds confidence and underscores the accuracy of our reading. With a silent client, it helps to call upon Spirit with an extra prayer for flashes of insight and angelic guidance in lieu of dialog. Everyone is different, but it’s important to schedule a break to eat, reset, or simply rest. How many readings we can do in a row before feeling overwhelmed or out-of-body may vary. Check in with yourself. If it’s a low energy day or you’re not feeling 100%, schedule more breaks than normal. Some readers take a mid-morning and a mid-afternoon break in addition to lunch. Over time, each reader finds our own rhythm and self-care schedule. I’m getting sick of it. How should I handle this? Personal growth—and the surrounding issues—can take a long time to work through. Sometimes a seeker needs to look at the situation from a variety of perspectives before resolving it. The process may take a few years. Though we offer readings and insights, we cannot know everything about a person’s life, nor can we cause them to change. Might our own ego make us impatient by wanting us to be “right”? Also, our irritation with another person may be about something irritating in ourselves. Gratitude for the irritation helps us see ourselves more clearly and continue our own journey of transformation. Do you have a question about being a Transformation Oracle reader? The author’s intent is to provide general suggestions to help guide you on your spiritual journey. In the event you use any of the information on this website as part of your process, the author assumes no responsibility for your actions.